4.2 What's the purpose of links? First of all, any link to your site can bring you visitors. If your friend T–Jay has a website www.t–jay.com and you have a site www.alison.com, T–Jay can put a link on his site that leads to your web page: visit Alison. Some people that come to him will see that visit Alison link leading to you, click it and come to your site, too. So it′s good to have lots of links — they′re sending more people to your site. Secondly, (though much more important for you), Search Engines also see links. And they not only follow links to crawl your site. They look at links as a proof of your site′s importance. In terms of SEO, links work like votes. And this needs to be discussed in more detail. In fact, each link is a vote. If 5 sites link to your site that means that you′ve got 5 votes. I guess you remember what I told you about Search Engines — they′re trying to think like real people. So they basically think, the more links you have, the better. Yes, Search Engines rely on many opinions. For instance, one of my friends is going to Rome but hasn′t chosen a hotel yet. Maybe I could give him a piece of advice? I′ve never been to Italy, but my wife went there on business trips, and I′ve heard from her that she didn′t like Hotel Milton Roma, but Astrid was very good — so that′s what I′ll tell my friend: Astrid must be good. But then he asks three more opinions, and other guys say that Hotel Astrid was disgusting, so he′ll rather trust the majority and won′t book Astrid either. It′s by the links that Google judges how important your site is. If many sites vote for your webpage, Search Engines think that it really has something important to offer and can be useful to Internet users. So Search Engines will show your webpage higher in their search results pages, thus making it easier for visitors to find. Simple logic of this would look like this: I′ve got 1,200 links, and my competitor has 1,000. So I should be in a better position. Still it′s not that easy as it seems. First of all, the relevancy matters. When backlinks to your site come from sites with related content, such links are considered more relevant to your site. For example, my friend James sells kitchenware online and has a listing (with a link to his website) in an online catalogue of kitchenware suppliers. In a Search Engine′s assessment, this link would be more relevant than, say, a link from a site about dog food. Secondly, links are not created equal. Like anything else, links can have high or low quality, and due to that, some of them are more trusted by Search Engines than others. And in fact, how good and relevant your links are is much more important than how many you have. So remember that it′s thanks to links that you finally find your site at the top of Search Engines′ results pages. 4.4 What links to get? Before I tell you this, let′s recall that links serve two purposes. They send you visitors, or traffic, from other people′s websites. 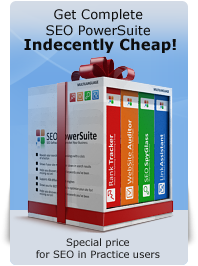 They work for SEO: improve your position in Search Engines and let you get more visitors through natural search. (= brings 30% more money). Here′s the obvious conclusion: it is more profitable to get links for the purpose of SEO. I often say "buy, beg or steal" but in fact, when you′re getting links, generally there′s just one parallel here: free — and non–free. So you can get a non–paid link if your page′s content is really valuable and important and someone decides to link to you. Or you get a free link in exchange for something: say, a reciprocal link. And you can get a paid link, which is probably much easier, but is not always that good. Here′s what Search Engines believe: if you′re buying a link from site A, you wish to get visitors from that site also come to your own site (like Alison was getting visitors from T–Jay). Search Engines do not actually expect that you would buy a link in order to get an extra "vote" and raise your site′s rankings. Therefore, if Search Engines assume that a link is paid, they don′t give it too much value and it won′t be any good for your rankings. That′s what happened to one of the largest US retailers, JCpenney. The company′s website ranked 1st for dozens of most competitive keywords like: dresses, bedding, area rugs, etc. However, some of the backlinks were placed on the websites not related to clothing at all. Eventually, Google stepped in and applied some "corrective measures," thus burying JCPenny′s website. You can mark an advertising link. Search Engines themselves recommend using a rel="nofollow" attribute in paid links. This attribute tells Search Engines not to follow and not to index a link. So if you buy a link and don′t want it to be involved in SEO, make sure it includes the rel="nofollow" attribute. Search Engines believe in getting links to send people from one website to another. They expect that we shouldn′t be buying links for SEO. But the controversy is: if you′d buy links for the purpose of SEO, that would pay much better than if you′d buy links for visitors. Say, you′re optimizing for the keyword ecards and have a paid link from www.birthdays.com When we estimate a site′s traffic, we say that 100,000 of monthly traffic is really good. So let′s think that your link partner www.birthdays.com has got really good traffic. If you′ve got a paid link from some site, and 5% (which is normal for a link) of these people click on your link, then you′re getting 5,000 visitors. So in this case your #1 placement brings you 17 times more visitors than a link from traffic–rich site — which can result in a bigger profit. This demonstrates that good Search Engine position results in much more traffic than a paid link. And this is why we do SEO. Sites that are getting traffic thanks to optimization pay off better than sites getting traffic through paid links. It was a through article on link building. Thanks for sharing with us. Keep posting. information shared by you was limited i feel so i would like to know more information if you can do it so. SO, I wonder: today (2011), the "nofollow" is still worth? get good ones manually, then order auto links to them, that's a piramid. what does google think of your site if you were using adwords to promote your new site ? if you stopped advertising what would happen i wonder ? I want to get links(non paid) from the other sites for both (SCO &amp; visitors/traffic) purposes. How can i do this? or what steps should i take to achieve this? If u want to get link, u need to publish valuable information. There are different strategies,but this is one of them. How does Google know if the link is paid or not ? I want to ask one thing what we need to if we want to get a inbound link from a social networking sites? ( please do not consider advertisement for getting inbound links). I am talking about www.orkut.com which is most famous in India. and thanks for your wonderful content. I am in love with your book.